The Buddha lived 2,500 years ago in India and taught love, generosity and awareness. At the heart of his Enlightenment experience, alongside an awakening to the way things really are, was a radical and altruistic vision to alleviate the sufferings of the world which are so evidently all around us. The Nottingham Buddhist Centre is dedicated to the spread of the Buddha's message in a way that is relevant to us here and now, yet remains faithful to the essentials of the Buddhist Tradition. The centre is run by a team from the Triratna Buddhist Order, assisted by many of those who attend the centre regularly. It is affiliated to the Triratna Buddhist Community, a Buddhist movement founded by Sangharakshita in the late 1960's and originally known in the west as the Friends of the Western Buddhist Order (FWBO). This name was changed in 2009 to more truly reflect the international nature of the movement which now has centres in all six continents of the globe. The name Triratna also reminds us of our central ideals, meaning ‘Three Jewels’, which refers to the Buddha - the man who, through his own efforts, gained Enlightenment; the Dharma - the teachings and practices taught by the Buddha that help us to overcome suffering and create a better world; and Sangha - the spiritual community of Buddhist practitioners who are dedicated to creating a world free of suffering. For those new to the Centre, we have several weekly drop-in meditation classes, suitable for beginners, as well as regular 6- and 8-week Change your Mind, Change the World - an introduction to Buddhism and Meditation courses and our Open Doors mornings on many Saturdays. We also host many other activities that help to support a deepening practice of Buddhism. We run the Centre on the spiritual principle of generosity - dana in traditional Buddhist language - whereby we strive to make what we do freely available to all those wishing to benefit from it whilst also asking for what we need in order to keep the Centre running. We ask for both financial donations from those who can afford it and offers of practical help in running the Centre. Indeed, we invite people to help us in whatever way they can to make Buddhism available to more and more people. 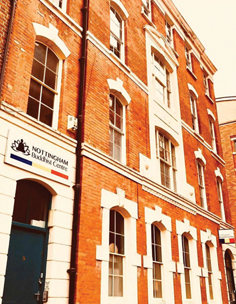 The Centre is located in the Lace Market district of Nottingham, right in the heart of the city centre. As well as our wonderful shrine room, our reception area has Nottingham's best-stocked Buddhist bookshop, which sells books on most Buddhist topics, cards, postcards and incense and some CDs. We also have some resources for the visually impaired in the form of CD recordings of some books. Although we don’t have a cafe, the Buddhist centre is vegan in that we only provide soya and oat milks for the drinks we offer at classes. Dana consists not so much in the act of giving as in the feeling of wanting to give, of wanting to share what you have with other people. We aim to give the Dharma or Buddha’s teachings freely to all those who wish to benefit from them. This is our practice of generosity. And you are welcome to attend any events held at the Buddhist Centre for free if you need to. Dana or generosity is a key Buddhist virtue. We like to see it as a spiritual principle that helps to create a strong sense of community and move us beyond the contractual exchange-based economics of most of the world we live in. Indeed, ‘give what you can and take what you need’ is how we would like to live in an ideal world. In the time of the Buddha, the wandering monks and nuns would have begged for their food, going from house to house until they had enough, and they would have relied solely upon the generosity of the village people to survive. Nowadays we don’t literally beg for food but we do rely upon the people who come to the Buddhist Centre to be able to financially support a small team of people to run the place as well as to pay for heating and the upkeep of the building etc.. So at each class we ask, with our metaphorical begging bowl in hand, for your generosity to help us keep the Buddhist Centre running. If you want to give in other ways, with practical help or time and energy, that will be very gratefully received too. More importantly though, we would like to make what we do available to as many people as want it. In order to reach out to more and more people, we need the funds to do so. If you are able to donate to the Buddhist Centre, a regular standing order is the best way and, being a registered charity, we are able to claim tax back on that too. If you wish to make a one-off donation now, just click on the link below. It will be very much appreciated.